In 2017, the proud owners of Cool Cache Farms in Kenai, Alaska, shipped 23,000 long-stemmed peony buds to buyers in the United States and Asia, and their sales continue to rise. Though peonies have been cultivated in America since the 1800s, they only recently became popular in Alaska. In 2002, former University of Alaska Fairbanks horticulturist Patricia Holloway ’76 MS suggested them as a possible cash crop for the state. Her instincts were right on target. Not only do peonies thrive in a cold climate but the large fragrant flowers reach maturity during July, August, and September, a time when they’re unavailable anywhere else in the world. The long days and cool Alaskan soils also produce flowers in more brilliant shades of red, pink, white, cream, and coral than those farther south. Wayne says that’s because peonies have a color-enhancing enzyme that stays active during cool weather but fades, along with petal color, in the heat. It’s all a boon to a state that struggles with agriculture, says Wayne. “Alaska used to produce 65 percent of its food locally. After the discovery of oil, many farmers left their land to work for the oil companies. “The governor and legislature are working hard to reverse that and we’re starting to see some progress,” he says. For their part, the Floyds are active in the Alaska Peony Growers Association where Wayne is chairman of the export committee. “The state is looking to increase its global exports and we broke into that market last fall by shipping stems to Vietnam,” says Patti. This spring, the couple tried to expand those sales with a whirlwind scouting trip to meet buyers in Hong Kong, Macau, Taiwan, Japan, and Korea. Protecting their floral investment is a vital part of the job. Peonies, especially in Alaska, are susceptible to a destructive and costly fungal disease called gray mold. Gary Chastagner, professor of plant pathology at WSU Puyallup Research and Extension Center, specializes in diseases of ornamental flowers and says gray mold is caused by several species of Botrytis which thrive in areas with cool wet summers. The fungus produces unsightly blemishes on the buds and foliage as well as significant post-harvest decay. It all results in a bountiful yield that calls for a few extra pairs of hands. 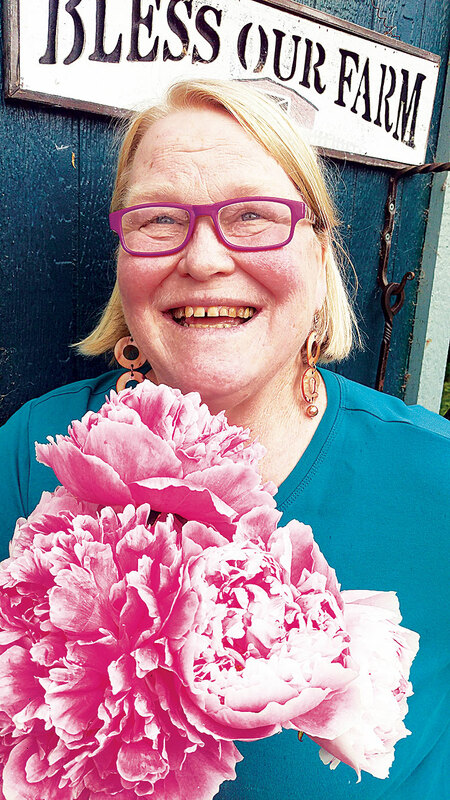 This summer, the tiny peony farm has blossomed to the point that the Floyds plan to hire ten or eleven community members to help bring in the harvest.